We have crystals on the brain at LEO DUO. It is the high season for designing custom Halloween costumes, and everyone seems to like a bit of bling. We’re also creating a fabulous cocktail dress for a special event, and the dress is a showstopper of sparkle. Being surrounded by all of these twinkling gems, and especially watching how they captivate Jeannie’s toddler daughter, brings back childhood memories. 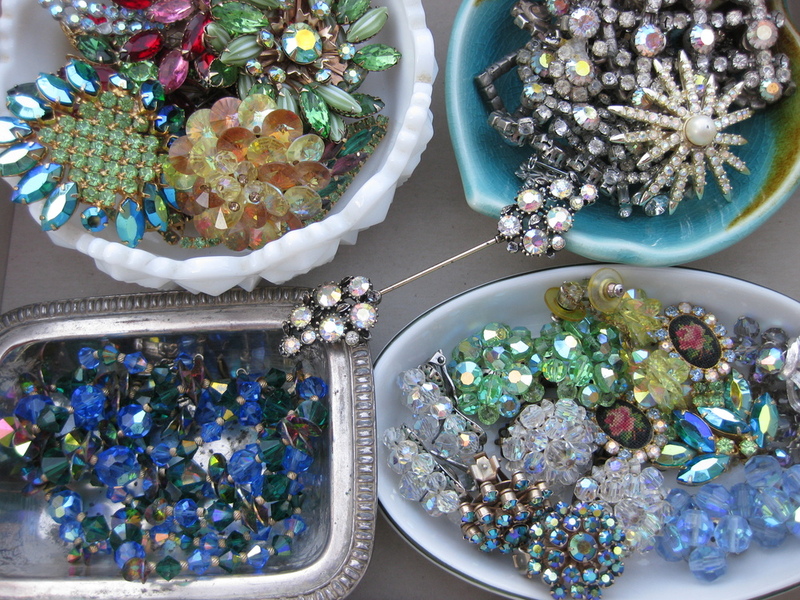 Both of us fondly recall reverently looking through our (respective) grandmother’s collections of costume jewelry. Favorite pieces were the rhinestones that had the Aurora Borealis, or AB, finish that was pioneered by Swarovski in the mid 1950’s. We loved the way the AB finish made tiny rainbows glint off the surface of the stones. Examples of vintage jewelry with an aurora borealis finish, from the personal collection of the LEO DUO designers. Is it any wonder then that today we are obsessed with Swarovski’s line of multi-colored crystals? Their “Effects” collection of colors includes stones that change color depending on how the light hits it. Not to be confused with an AB finish that coats any stone with a silvery/pastel rainbow reflection, these effect stones are like an ombre crystal in gorgeous vibrant tones.